With the year 2018 just round the corner, many business owners are simply wondering if they should stay with the strategies they charted in 2017, or make certain changes in it. If you have plans for some new online marketing strategies to define your ROI expectations and growth goals, then reading this blog will be worth as I will discuss some of the latest digital marketing trends that you should consider both for the coming year and beyond. With many exciting and informative things found online, whether it is a top commercial or a Santa Claus distributing gifts, there is always an element of video. A video often helps people to accept and also attach on a deeper level because of the visually rich and interactive elements that a moving picture depicts. And as a result, audiences are tempted to take certain actions like sharing or likes etc. With time, popular brands have been successful to capitalize on highly engaging videos that features on various social media platforms like Twitter, Instagram. Facebook and many more channels. The trend of using high quality video content is likely to soar high in the near future. Most B2B buyers rely heavily on the content when they research to support their purchase decisions. Clear content that directly connects with consumer helps to keep them engaged and is an increasingly important factor that has to be considered to enjoy bigger benefits. Content that is specifically tailored for both the customer’s needs and that can guide during their buying process helps to boost sales. Marketers delivering personalized content are able to enjoy double digital returns in marketing performances and response and is a crucial factor to reach out to the customers. Native advertising has gained much popularity when it’s time to grab the exposure in front of a local audience. Most users find it very frustrating when they see interruptive ads that are irrelevant. Native ads help to bring the brand to the market with their offerings in a non-disruptive way that blends perfectly with the environment that the user is very comfortable with. With native ads, customers may not even spot that they have been viewing advertorial, or instant content in the form of native advertising. 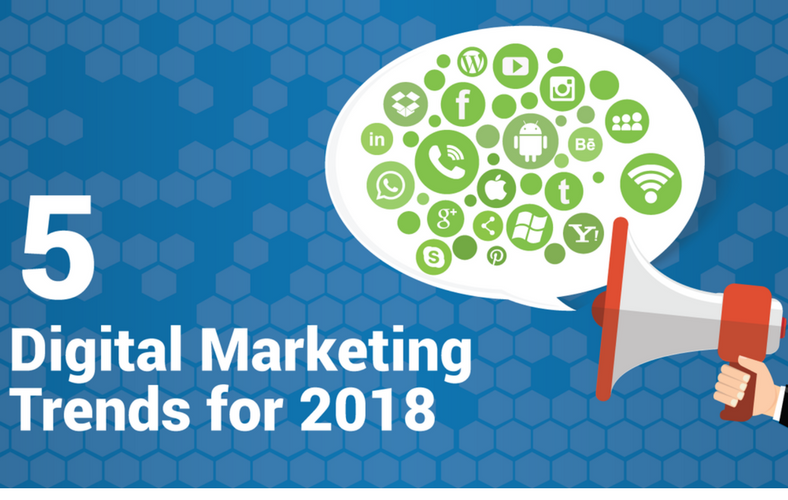 In the year 2018, B2B marketing is expected to invest more on social media marketing. The prime focus of this expansion is to understand the customer’s behavior and send them a consistent branding message. On social media you can ask about the customer’s experience of interacting with your brand and then determine the networks that are most important for your business growth. Today, social media marketing is shifting towards strong emotions by offering engaging content and storytelling. In 2018 most digital marketing platforms will allow the users to create and share live video content and also find news and latest events going on around their location. This is one of the most common terms in the data management and since huge amount of data is involved in digital marketing cultures like native marketing, segment marketing and personalized marketing, its implementation into the online marketing strategies is crucial. Utilizing big data will help to understand customer behavior and improve decision making processes. If you have not prepared your digital marketing strategies, then it’s time to create one and dominate the future. Therefore, you should start to incorporate the latest trends in the planning process for 2018 and prepare beforehand to enjoy a competitive edge over your rivals.